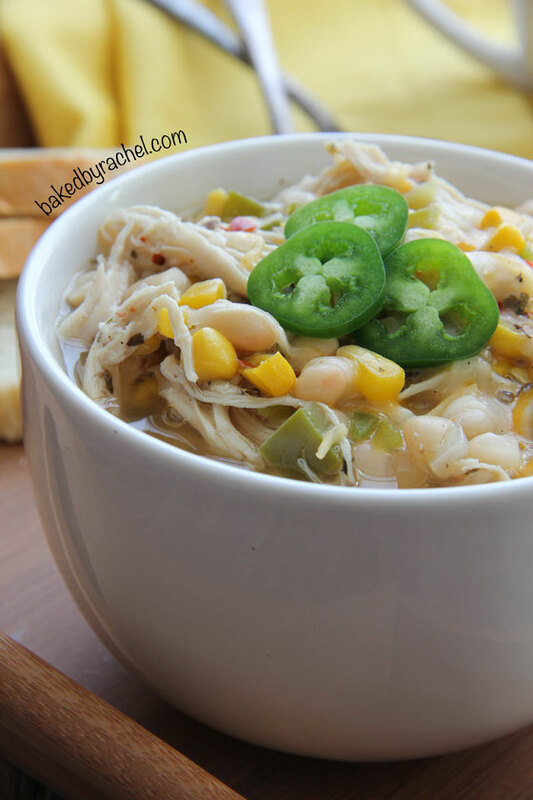 A hearty white chicken chili, with a spicy kick! With the slow cooker doing all of the work, it’s a perfect meal for any night of the week. I knew it was coming. The day when I’d finish Veronica Mars and I’d have to become productive in the afternoon again. Someone tell me, did the show just abruptly end? Canceled without the chance to give the characters a good send-off? Because that ending was crap. Sorry to spoil it if you haven’t seen it, just brace for it to not end how you may want it to. I only hope that the movie wraps things up better. It’s snowing again. Not yet, but soon. And we’re supposedly getting slammed with another foot, or so they’re saying right now. Things could change. And the last storm we were supposed to get 6-8+ or something like that and only got a dusting… so I’m not holding my breath here waiting for it to pile up. I’ll just wait it out and see what happens. We’re used to that around here. Just put up with the snow and deal with whatever shows up. But, I am ready for Spring. We got a tease of things to come over the weekend… nearly 50 degrees. Seriously, that’s a treat in February. Ahh… flowers, wattamelon roll, warmer weather and of course… longer days! It’s already starting and I’m super excited for that. So because more snow is coming, and because it’s still very much Winter… here’s another totally comforting slow cooker recipe, perfect for any day of the week. It’s great for lunch or dinner and is truly both easy to put together and tasty. I shared a white chicken chili a while back, but wanted to share an updated, even better version. 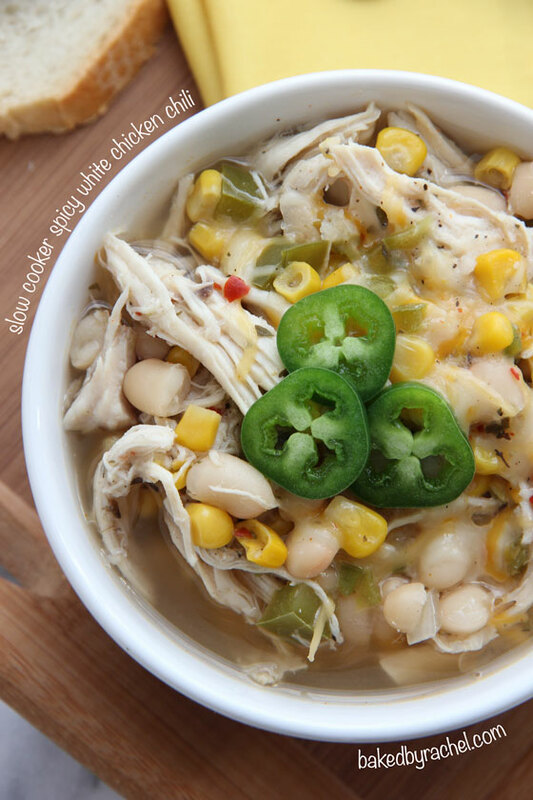 An easy slow cooker white chicken chili, loaded with seasoned shredded chicken, veggies, beans and topped off with an essential sprinkling of Monterey Jack cheese and fresh jalapeño slices. This chili offers a nice spicy kick. 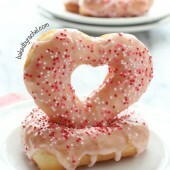 This is an absolute must make. I know I say that a lot, but it’s true. I wouldn’t share something that isn’t really good. 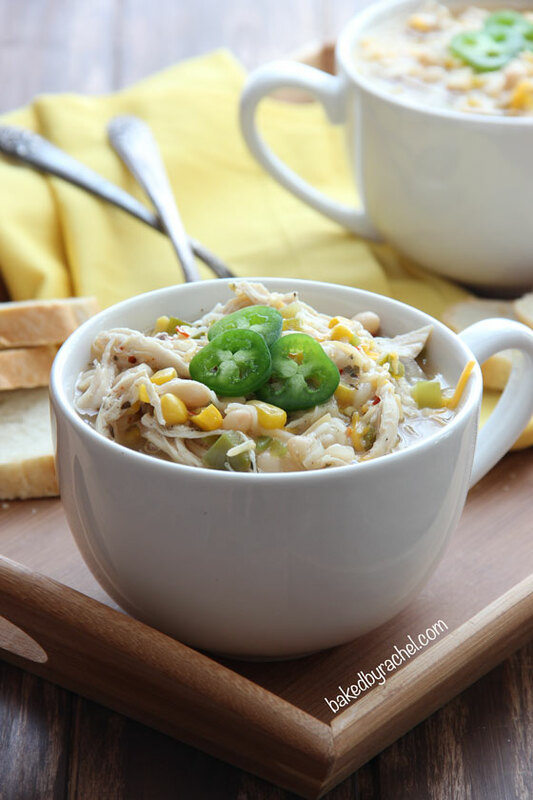 A hearty white chicken chili, with a spicy kick! With the slow cooker doing all of the work, it's a perfect meal for any night of the week. Add all ingredients to the bowl of a 5-6 quart slow cooker. Cook on high for 4 hours. Remove chicken, shred and return to slow cooker. Divide among bowls. Serve with optional toppings such as cheese, jalapeño slices, sour cream, etc. 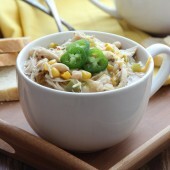 I love white chicken chili! Definitely going to try this one. We made your whole wheat buffalo chicken pizza on Saturday night and LOVED it! I wish this was cooking away for me right now! Love the heartiness! Another slow cooker soup/chili to add to our rotation. 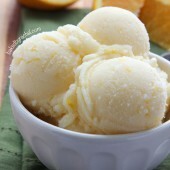 This is a must try, Rachel! I prefer my chili on the spicy side too. Perfect. A spicy kick is always nice :) Thanks Sally! You know I love a slowcooker meal, and this one looks great! Bookmarking to try soon! I’m a HUGE VMars fan, and yes it is that unsatisfactory of an ending. The producer and show creator pitched a time jump Season 4 to the network, with Veronica working as an FBI agent, and even created a teaser clip of it to show the powers that were, but it didn’t work. Hopefully the movie does well and we get even more Veronica! Also, I’m preparing for the snow in Boston, so chili is definitely on my menu this week as well! If I could picture an image definition for the word “cozy” that would be it! And, as always, love the slow cookery! I’ve never seen Veronica Mars, but I love binge watching old shows, so I will have to check it out! This chili looks so good! I swear, all I want to eat in winter is soup!! 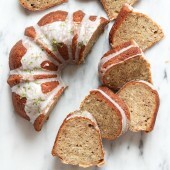 This looks so comforting and delicious. You really should! It was pretty fun to watch, even if it was only 3 seasons. I bet this chili just pops with flavor. Love any slow cooker meal right now. They are saving me from all this crazy winter weather! We got blasted with snow the past 2 days. I think there is at least 8 inches out there…I stayed inside so I really don’t know. I do know that your chicken chili looks fabulous! I love how chunky and comforting it looks! Bring on the spice! I love chili, definitely saving this recipe, it looks so warm and delicious! This chili was awesome!! Are we supposed to drain the beans? I did not and it was like soup – just making sure I did it right! Everyone loved it!! I love spicy foods. especially chili. My boyfriend cant handle the spice as much as me though. This will be my first time making a white chicken chili. I am just wondering, is it possible to add a sugar? To make it an almost sweet spicy? I add brown sugar to my ground beef chili, but this flavor seems to be a lot different. Any add ins to help with the spice? or maybe I should omit a certain ingredient? I definitely don’t recommend adding sugar to this. To cut down on the spice, your best bet would be to not add both the red pepper flakes and jalapeño. Can you do this with rotisserie chicken? You certainly could. Just be sure to wait and add the chicken towards the end, since it’s already cooked. Can I use chicken from a rotisserie chicken? If so, should I wait to add it in until later since it’s already cooked? This soup looks so yummy! You definitely could. And yes, I’d recommend adding it towards the end of the cooking cycle. Made this today to enjoy when we returned home from Apple picking. The flavors were great, but there was a lot of liquid. I think it was more like a stew or soup than what I think of as chili. I took some of the beans out and puréed them and added them back in to thicken it. I would make it again, but either increase the amount of chicken or decrease the liquid.